As with many things in life, medicine is more difficult if your left-handed as everything is set up without a thought for us, but it’s easy comapred to haing to use s dip pen when I was at school, aged 8 in France in the 60’s. The inkwell was at the top right hand corner of the desk. All my work was marked ‘sale’ (dirty) because of dripped and smudged ink. I was hit with a ruler because of it. Still, I managed to learn good hand writing in the end to the point where I often used to get comments such as “you’ve got very neat hand writing for a doctor’ and I used to add left handed and female. Question for everyone, when I was about 9 years old I wrote with my papers almost upside down with my wrist bent as far as it would go, when my teacher first noticed this she encouraged me to try and keep my wrist straight, with out much luck I was too used to the way I was writing. One day she came in with a device to keep my wrist straight, she may have made it herself, it was a ruler or slat inside a leather sleeve that had straps at one end and in the middle, she put it on the inside of my arm and into the palm of my hand then strapped it to my forearm, so I couldn’t bend my wrist. Has anyone had a similar experience? It took a few weeks, but I learned to write with my paper top up and my wrist straight. Have never met anyone with a similar experience so I’m thinking she thought it up and made it herself. If 10% of the world is left-handed, why are we not acknowledged by business organisations? Even the arts and writing equipment is produced for right-handedness an the areas where the percentage is dramatically increased? Wouldn’t it be a simple thing for companies who offer a free pen inscribed advertising your business – no left hand option is offered!? Maybe this shows the lower intelligence of right-handers. I am 74 and the only lefty except for one maternal aunt. I shoot rifles and bows right handed, bowl and golf left. However I can shoot a pistol with either hand. I think a lot of lefties become good with either hand just to be able to function. Writing has never been a problem, I do not curl my hand around like a lot of lefties, just moved the paper. I learned cursive in school and had nice hand writing. My saying goes: Left handers aren’t born frontwards or backwards – left handers are born oddwards. Although I am 85 years old, after my first teacher saw what a mess I made using my right hand I was allowed to use my left hand! My hand-writing was never very good when I was young, and I remember vividly being punished (with the ‘strap’) for smudged work. Sewing was difficult, but I worked out my own way of coping well. My left handedness became more of an asset when as a primary school teacher I was able to support my left handed pupils. I use cutlery as righthanders, except soup spoons, where I revert to my left. When I was in my 60s I took up calligraphy which I enjoyed. I would copy her way of using the needles, and it presented no problem. I have never, however, been able to cope with crochet! I play the piano, and I think it is an asset. 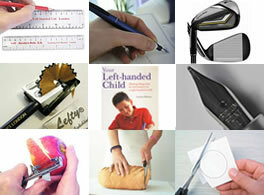 Altogether, I love being left handed, and wouldn’t change for the world! 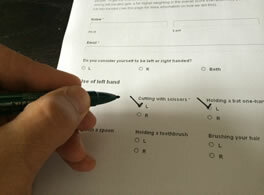 Thank ya`ll for conducting this survey! It`s nice to know we have kindred spirits of all ages & from all over the world! I`m 61 yrs old, it has been difficult trying to live in a right handed world all my life. My sister tried to get me to write right handed, but, when she couldn`t change me, she “showed” me how to write with my left hand, but, not curving my hand above the words I wrote. A little wierd, but, I`ve still got pretty handwriting! And with the proper pen (thank God for left handed pens) it looks a lot better with no smudges! Thank you for your services!!! Growing up, I was the only left hander in the family, but my parents decided that as I’m naturally left handed, then it was just better to let me be left handed. I’ve only ever had one person ask me if I would like to swap hands and use my right hand instead, but I don’t want to. I like being left handed! Especially as I’ve been told that it’s a sign of intelligence. A surgeon who was righthanded told me, he often practices fine motor skills on his lefthand. For reasons if ever accident he would be out of work. He went on to say a surgeon who is lefthanded has a great advantage in this field.